Caribbean-themed products for children everywhere. Bim & Bam™ is an animated adventure series for children, set in the Caribbean. Twin siblings Bim & Bam have free reign when it comes to adventure – and there are a million things to get your imagination working overtime when exploring an idyllic Caribbean island! The naturally curious 5-and-a-quarter-year-old twins (Bim is the girl; Bam, the boy) are on their first trip to their parent’s birthplace – the Caribbean. Who would have guessed that tiny islands could be so chock-full of big fun beyond just sea, sun or sand? The potent pair relies on instinct, curiosity and teamwork to figure things out as they explore the amazing world around them. Thankfully, a combination of their bright ideas, some superhero tools and a few good friends makes nothing impossible. To Bim & Bam, life is the greatest adventure: they are always expanding their boundaries and mastering new skills with every fun-filled experience. 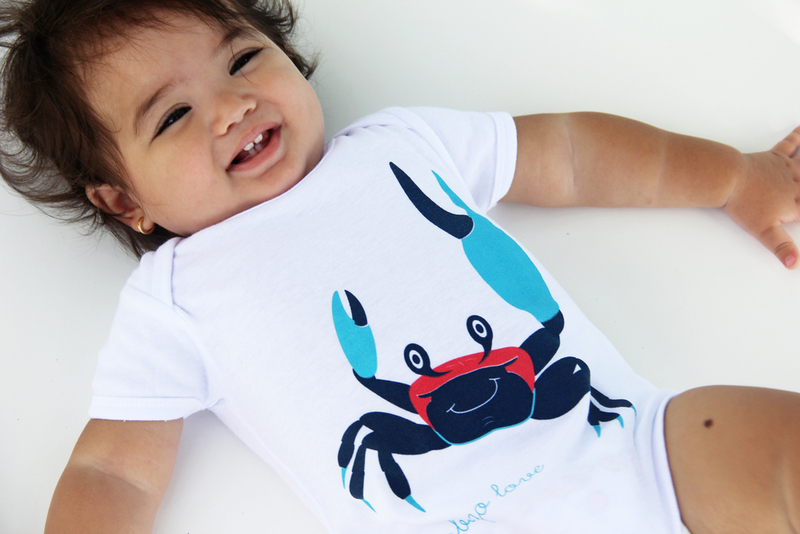 The first production "Island Babies" is a series of screenprinted t-shirts, features characters such as the endangered leatherback turtle, coconut, blue crab and snowcone through childlike eyes. 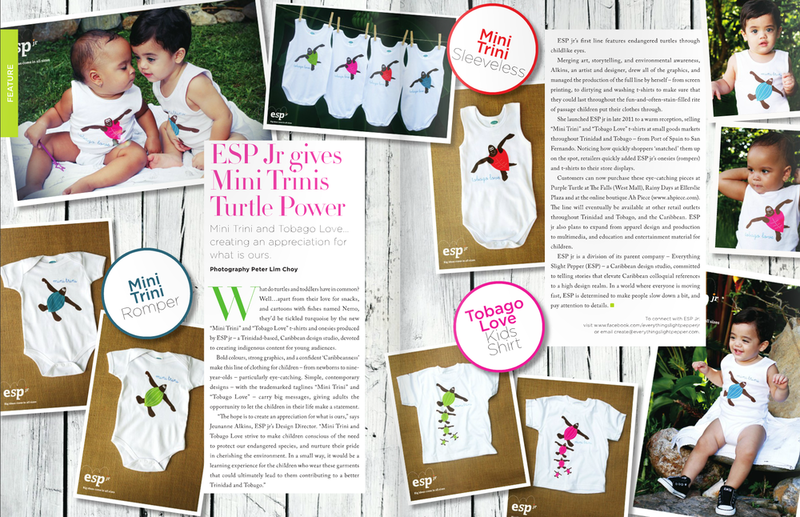 Bold colours, strong graphics, and a confident ‘Caribbeanness’ make this line of clothing for children – from newborns to seven year olds – particularly eye catching. 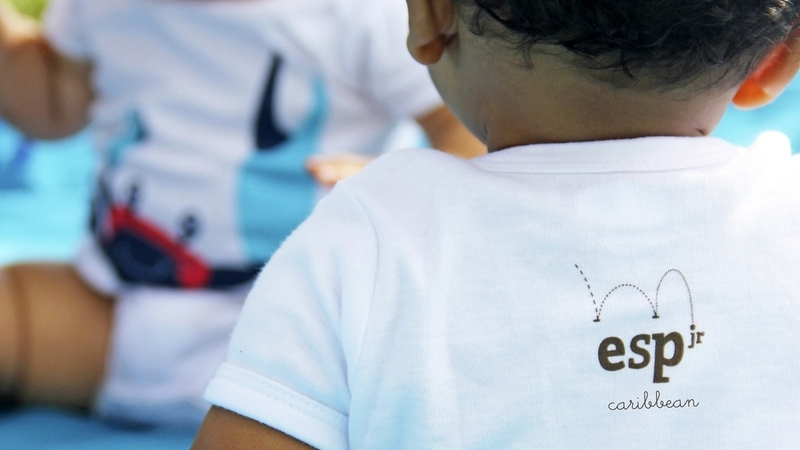 The brand strives to make children conscious of the need to protect our endangered species and nurture pride in cherishing our culture and environment. Other products in development include an animated tv/web series, books and activity sets. Picture book - "Island Babies: Ready.SET..HATCH!" "Hatch is a competitive little Leatherback Turtle. He and his tiny hatchling brothers and sisters are racing wildly to crack out of their eggs and be first to get to the sea. Crisis arises as the nearby river breaks its banks, flooding the nest. Narrated by Hatch, this charming story teaches the young turtles a lesson about teamwork - they discover that unless they work together, no one will get out of the crumbling mess!" The ESPjr Island Babies series uses character led lesson-based storytelling to entertain readers while simultaneously teaching about the culture and environment of the Caribbean. The first in this 4-part series, "Island Babies: Ready.SET..HATCH!" is a charming picturebook featuring the leatherback turtle "Hatch," geared for international and local audiences alike - ages 0 and up.